The site features specific news and information for journalists. High-resolution images are available for editorial issues. Raisting: November 1st 2014 DARCO (Europe) has joined EPUAP (The European Pressure Ulcer Advisory Panel) in the worldwide initiative: "STOP Pressure Ulcer Day". The Campaign's goal is to elevate awareness and promote education about pressure ulcers among medical professionals, communities and policy makers around the world. Original MECRON products now available exclusively at DARCO! A strong brand finds a strong partner. Raisting: August 1st 2014, DARCO is exclusively taking over the distribution and sales of the original, made in Germany MECRON products throughout Europe. The leading worldwide supplier of orthopaedic aids and shoes is bringing the MECRON brand under its roof and is thus fetching a far-reaching expansion of its product range. 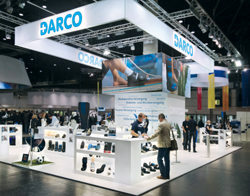 Raisting: At the beginning of April, the European headquarters of DARCO (Europe) GmbH organised the seventh meeting of their international distributors in the field of orthopaedic devices and shoes. Get the pressure under control! - DARCO WCS. Wound Care Shoe effectively redistributes pressure on the diabetic foot. DARCO, one of the worldwide leading companies in the field of orthopaedic foot and ankle products is focusing in particular on Diabetic and Wound Care solutions. Diabetic Foot Ulcers are becoming more common and the main challenge will always be the successful treatment of the wound as well as the recovery and re-establishment of the patient´s mobility.